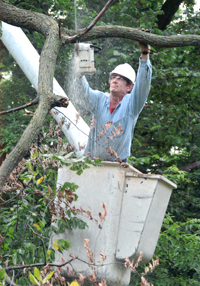 Have Michigan's winds and weather damaged your trees? Are your branches and bushes in need of healthy trimming/pruning? Is a tree a bit too close to the power lines? Might a dead tree require removal, perhaps a stump needs eliminating? Welcome to Grant's Tree Company, LLC, an insured residential and commercial tree service, family-owned and operated by Don Grant for nearly 30 years. Conveniently located in West Bloomfield, Michigan, we gladly travel throughout Oakland, Macomb and Wayne counties to serve our customers. At Grant's Tree Company, we specialize in professionally, safely, and properly pruning and cutting trees, ornamental trees and bushes . We work with homeowners, businesses, commercial property owners, real estate companies, and property development firms. We will meet with you at no charge to assess your trees and bushes and determine your specific needs. Customers like and trust Grant's Tree Company and appreciate our friendly, positive attitude, quality work, and on-time arrivals. Our repeat customers and consistent referrals represent the majority of our work and speak about our excellence. We follow through with what we say we will do and come through in a pinch when customers need us. Always, we utilize safe procedures for trimming and cutting your branches and trees. And, we completely clean up at the end of each job. Often, wonderful people call us to remedy a not-so-wonderful tree situation brought about by someone with a truck and a chainsaw who calls himself a tree company. Grant's Tree Company is insured, highly experienced, very particular about our work, and we employ only professional technicians and utilize hand tools, cranes, and other industry equipment to properly and effectively cut your trees. We invite you to contact Grant's Tree Company at (248) 681-0498 or info@grantstreeco.com.